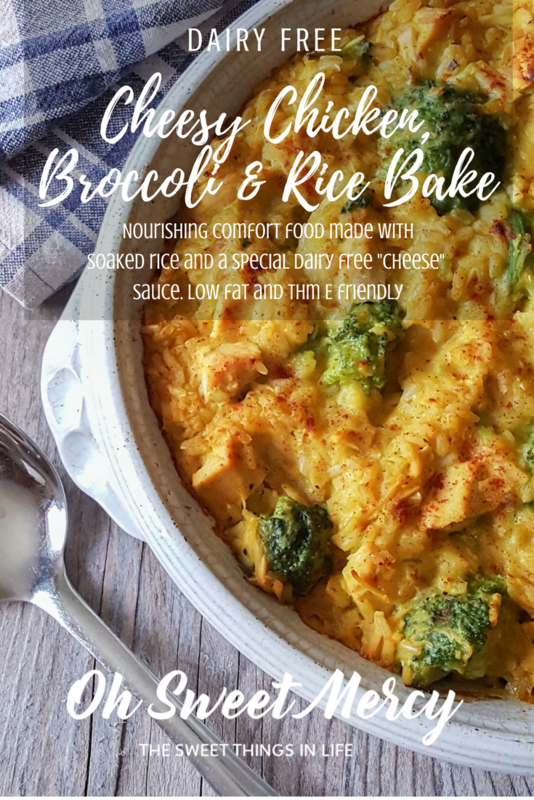 Dairy Free Cheesy Chicken, Broccoli, and Rice bake is not only perfect for dairy free peeps, but also Trim Healthy Mamas. The “cheese” sauce in this recipe is a Fuel Pull, making it a perfect companion to healthy carbs like soaked brown rice. Your eyes are not deceiving you! A dairy free CHEESY chicken, broccoli, and rice bake is actually possible. Go ahead and do a little dance, I’ll wait. I know that’s a big deal! How can you make dairy free cheesy anything? Please take a moment right now and read about Today in Dietzville’s magical Dairy Free Instant Pot Queso. And please be sure to thank Lindsey for her amazing, creative, dairy-free cheesy gift to humanity! 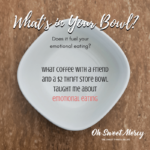 Then come back and see how I tweak that wonderful recipe to make a nourishing, dairy free comfort food. That cheesy sauce is addictive. I just want to keep eating it every time I make it! Confession: I am fine just dipping a spoon in it. I don’t even need chips! Don’t worry if you don’t have an Instant Pot, you can still make this on your stovetop. Just cook the ingredients until they are very soft and you shouldn’t have a problem. 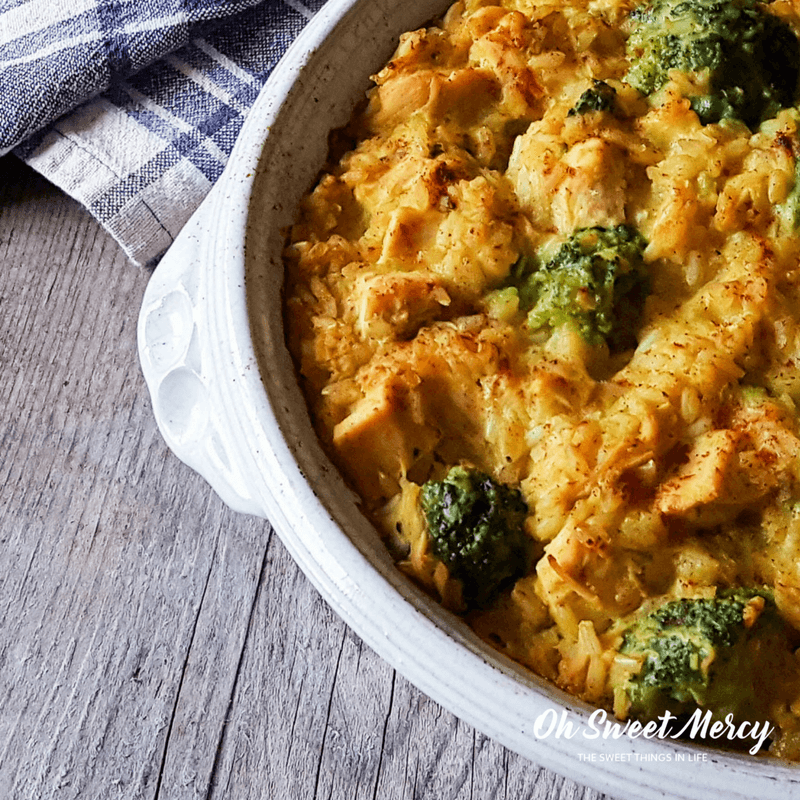 Do make note of a couple changes I make to Lindsey’s recipe when making this dairy free cheesy chicken, broccoli, and rice bake as it will make a difference in the flavor outcome. Plan ahead for optimum nourishment! Have some bone broth ready! Healthy bone broth, with the fat skimmed off, will also boost the nutrition in this recipe. Gelatin (what makes bone broths thick and jiggly when cold) is expensive when you buy it powdered, but can easily be rendered out of the bones of organic chicken. 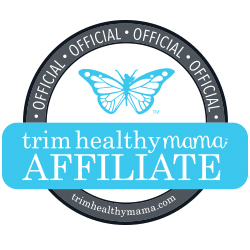 You’ll also get the benefit of collagen – another expensive specialty ingredient on the Trim Healthy Mama plan! Keeping bone broth on hand over the winter will also help support your immune system and keep you healthy. Bone broth is easily made in an Instant Pot. In fact, it is now my preferred appliance for making bone broth. Too many times my way-too-hot slow cooker burned my broth, and it takes hours to make. In just about 2 and a half hours or so, my Instant Pot delivers the best bone broth ever. If you’ve never made bone broth before, my bestie The Homesteading Hippy will help you with an easy tutorial and recipe. Be sure to skim off the fat to keep your bone broth suitable for FP and E recipes, like this dairy free cheesy chicken, broccoli, and rice dish. You can always use whatever fat free broth you have on hand but bone broth is more nutritious. Grains are best when they are soaked. 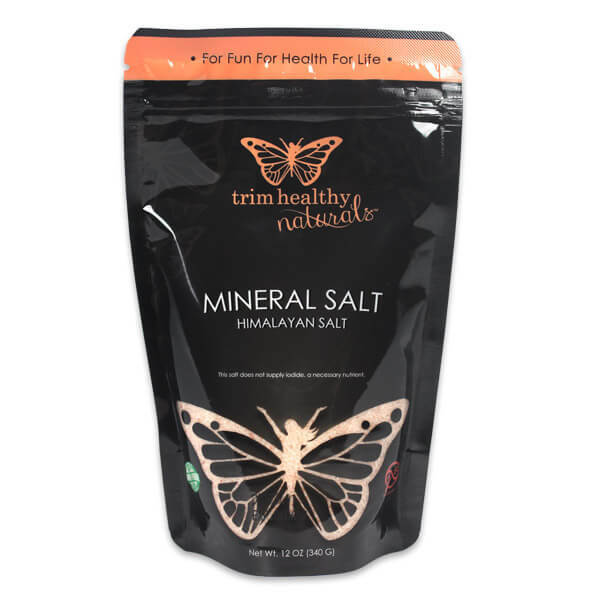 This reduces phytic acid that is naturally present in the grains but hinders the body’s ability to absorb nutrients. Soaking overnight in an acidic medium neutralizes phytic acid. Soaking rice is super easy! Just put your brown rice in a glass bowl or even a wide-mouth mason jar, add water and acidic medium, cover and let sit for at least 8 hours. Many people use whey or kefir as the acidic component, but for dairy free folks raw ACV or lemon juice also works. If you’re afraid the rice will be too sour, just rinse it well a few times before using it in a recipe. Soaked rice will also freeze well so you can do a big batch of it and divide it into recipe-sized portions to freeze. Then you’ll always have these healthy, soaked grains available when you need them. One more benefit of soaking brown rice – it becomes less chewy. So your brown-rice haters will be more likely to gobble up this comforting, nourishing dish and not even notice! There is no added fat which makes this recipe a very low fat E! Use your added fat grams in a dressing for a healthy, leafy green salad or for a bit of butter over steamed green beans. Stick to a 1 or 1 1/2 cup serving. The protein in your meal comes from chicken breast plus the protein in the “cheesy” sauce. You can also add more chicken breast if you feel you need a bit more protein. Are you ready to make this dairy free Chicken, Broccoli, and Rice Bake? As the holidays approach, be sure to put this delicious dairy free comfort food recipe on your menu. It’s often hard to eat well over the holidays, especially when you have food allergies or sensitivities or are following a specific eating plan. Being prepared will help you stay on track and healthy this season! Dairy Free Cheesy Chicken, Broccoli, and Rice Bake - Nourishing Carbs! 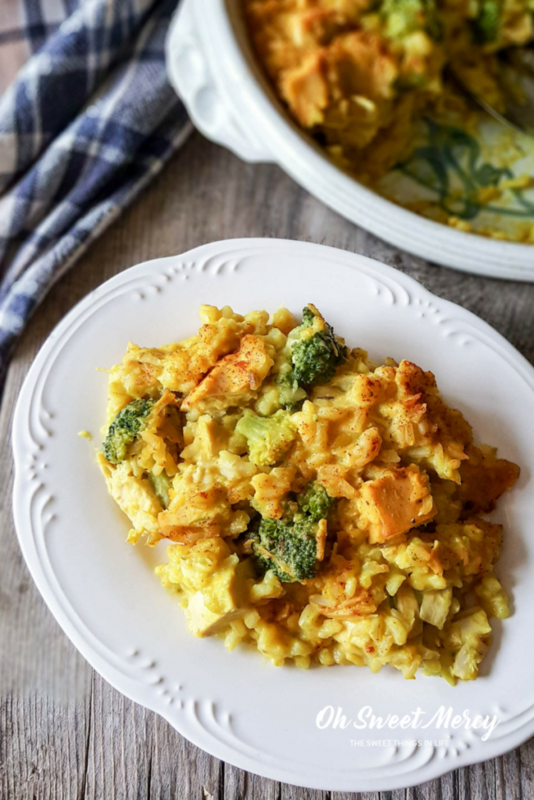 Dairy Free Cheesy Chicken, Broccoli, and Rice bake is not only perfect for dairy free peeps, but also Trim Healthy Mamas wanting cheesy comfort food in an E setting. The "cheese" sauce in this recipe is a Fuel Pull, making it a perfect companion to healthy carbs like brown rice. Be sure to plan ahead for optimum nutrition and have bone broth and soaked, brown rice available. 8 to 12 hours before preparing this recipe, combine 1 cup rice, 2 cups water, and 1 tablespoon raw ACV or lemon juice in a glass bowl or mason jar. Cover and set in a the warmest spot in your kitchen for at least 8 hours. After 8 to 12 hours, drain the water from the rice. Rinse for less sour flavor. Cook the rice using your preferred method. For stove top, combine rice with 2 cups of water and bring to a boil, cook until rice is tender. Add water if needed. Lightly grease or spray with nonsitck spray a 6 to 8 cup casserole or baking dish. In a medium mixing bowl, combine cooked, soaked rice, chicken, broccoli, 2 cups "cheesy" sauce, salt, and pepper and mix well. Bake in preheated oven for 30 to 60 minutes* or until lightly browned on top and bubbly throughout. You can use normal cooked, brown rice if desired. Baking time is at least 30 minutes but could take up to an hour depending on what you bake it in and how done you like your rice casserole. There is no added fat in this recipe which frees up your added fat grams for butter on steamed veggies or a bit of oil in a salad dressing. 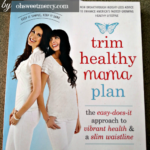 Be sure to refer to the Plan book for specific guidelines for E meals. MM this looks like the perfect hot meal on a cold blah night! NICE!!! 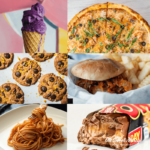 My children can’t eat dairy and I’m always searching for recipes they can try. I had never come across your queso but now I have it!! Thank you so much!! Can’t wait to give it a go. 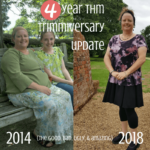 I hope you enjoy it! But I have to give the queso credit to Lindsey from Today In Dietzville, it is her magical creation! That looks so rich, warm and delicious! Thanks Linda! It is a very comforting dish! I can see omitting the peppers, but why omit the carrots? I would think they’d add to the “cheesiness” of the sauce. I’m super excited to try this recipe! Hi Courtney! I’m so glad you’re excited to try this recipe! I make this ‘cheese’ sauce without the carrots to keep the carb count super low, that way I can use it in S and FP settings too. Feel free to include them if you want! 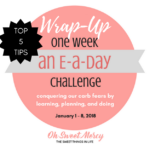 I am a bit more carb-conscious so I try to stick to the lowest carb counts possible in an E as that works better for keeping my blood sugar balanced. Hope you enjoy!